Learn how to make Buttery Smooth Instant Pot Lemon Curd Recipe (Pressure Cooker Lemon Curd). Super easy NO jar method! The velvety candied lemon custard cream is refreshing, aromatic, complex sweet lemony flavors. Seriously irresistible! Great DIY Christmas Gift. 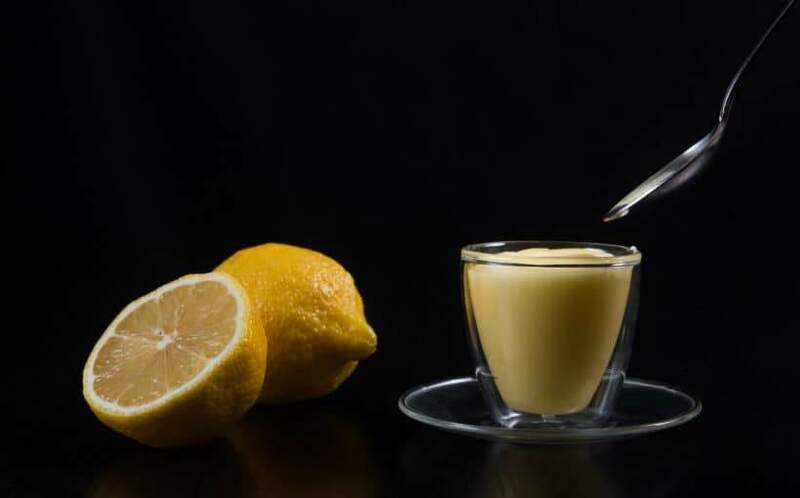 With lovely lemons in season, how can we miss out making some velvety candied lemon cream custard?! What is the #ChristmasGive Challenge? For the whole December, we’ll be publishing a series of New Instant Pot #ChristmasGive Recipes. We’re launching this #ChristmasGive Challenge to honor Jacky’s extraordinary homestay family. 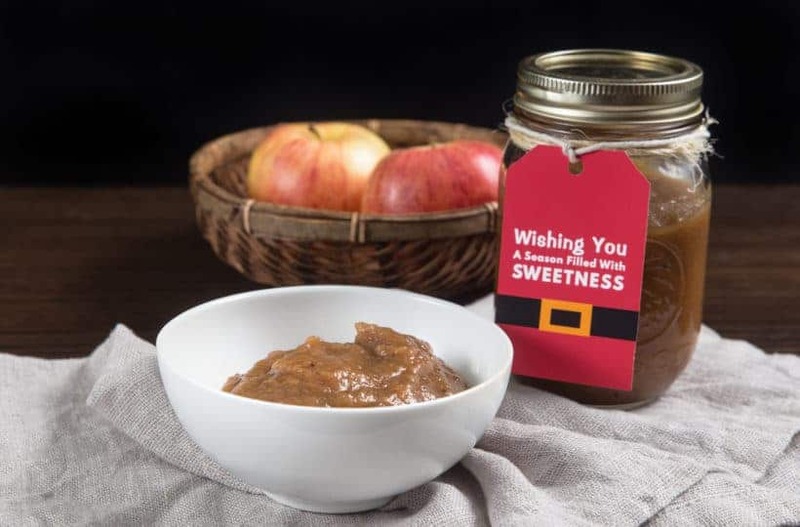 Our hope is to encourage you to make these delicious homemade gifts for your family, friends, or even strangers. Come join us! ? Together we can make our world a better place. A taste of citrusy lemony heaven – intensely complex sweet & tart flavors that melt into your tastebuds. A soft alternative to jam, but creamier, smoother, and more intensely flavored than pie fillings or custards. You can use it for topping, spread, flavoring, or filling. 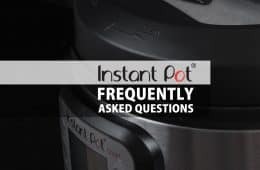 Why Use Instant Pot Pressure Cooker? It’s great making Lemon Curd in Instant Pot Pressure Cooker because it’s easy and no need to babysit the pot on the stove with constant stirring! We tested the Lemon Curd Recipe using different Eggs & Egg Yolks Ratios to see the differences. This experiment showed us egg yolks are the key to control the lemon curd’s thickness. We personally prefer Test #1’s creamy smooth lemon curd more. 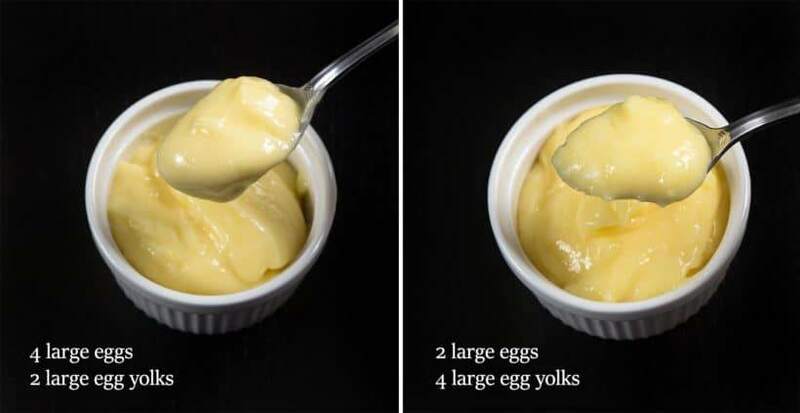 But if you prefer a thicker lemon curd, replace one large egg with one egg yolk. We wanted to see if the lemon curd will taste better by adding lemon zest. So, we made 1 batch of Lemon Curd with lemon zest in the lemon egg mixture, and another batch without the zest. Results: buttery sweet, tart, balanced, bold flavors, bits of refreshing lemon zest, smooth, creamy, aromatic, tastes like lemon candy cream that melts on your tongue. Results: smooth, creamy, the lemon curd is slightly flat tasting compared to Test #1 – consists sharp sweet & tart flavors that lack the balanced & complexity of flavors, the slight refreshing taste & aroma from Test #1 were also missing. Try not to skip the lemon zest in the lemon egg mixture!! 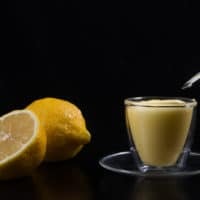 The lemon zest balances out the lemon curd’s flavors & adds complexity, refreshing taste & aroma. If you’re not a fan of having bits of lemon zest in your lemon curd, you can simply filter it out after pressure cooking. *Pro Tip 1: don’t use reactive tools to make the Instant Pot Lemon Curd as they may contribute a metallic taste to the final product. Best to use oven-safe glass containers and silicone whisk for best results. In a 7”x3” pyrex oven-safe glass container, break and whisk together 4 (204g) large eggs and 2 (38g) large egg yolks. Add 225g (1cup) granulated sugar and mix well. Add in a pinch of salt, 1 tbsp (5g) lemon zest, and 235ml lemon juice. Mix until combined. Place a trivet in pressure cooker and carefully layer the tightly wrapped glass container on the trivet. Pressure Cooking Method: High Pressure for 1 minute, then Natural Release for 10 minutes. Note: If your aluminum foil is quite thick, add on an extra minute to the pressure cooking time. Open the lid carefully. Carefully take out the glass container. Discard the aluminum foil. When you first see the egg mixture, it will look like an egg custard (as shown in photo below). Give it a few quick whisk and watch magic happens. Add in 100g room temperature unsalted butter, one half at a time and use a whisk to emulsify the butter with the egg mixture. Lemon curd is done and it will thicken as it cools. *Pro Tip 1: You can filter out the lemon zest with a fine mesh strainer if you like. *Pro Tip 2: If the lemon curd is lumpy, you can smooth it out with silicone whisk. Chill in the fridge for at least 4 hours before serving. We specifically used thick Pyrex oven-safe glass containers for this Instant Pot Lemon Curd Recipe because it’ll avoid overheating the lemon egg mixture. So don’t use Stainless Steel containers! Also, be sure to wrap the container very tightly with aluminum foil. This will protect the lemon egg mixture under pressure. The lemon zest will add complexity to the lemon curd’s flavors, but it’s important to avoid grating the bitter white pith when zesting the lemons! 4. Lemon Curd Not Thick Enough? When you first open the Instant Pot after pressure cooking, the lemon curd mixture will look like egg custard. Don’t worry! That’s normal. Just give it a few quick whisk. Keep in mind that the lemon curd will thicken as it cools and chilled in the fridge. 5. Lemon Curd is Lumpy? Instant Pot Lemon Curd Recipe (Pressure Cooker Lemon Curd) - how to make lemon curd no jar method: velvety candied lemon custard is refreshing, aromatic, delicious complex sweet & lemony flavors. Super easy to make & seriously irresistible! 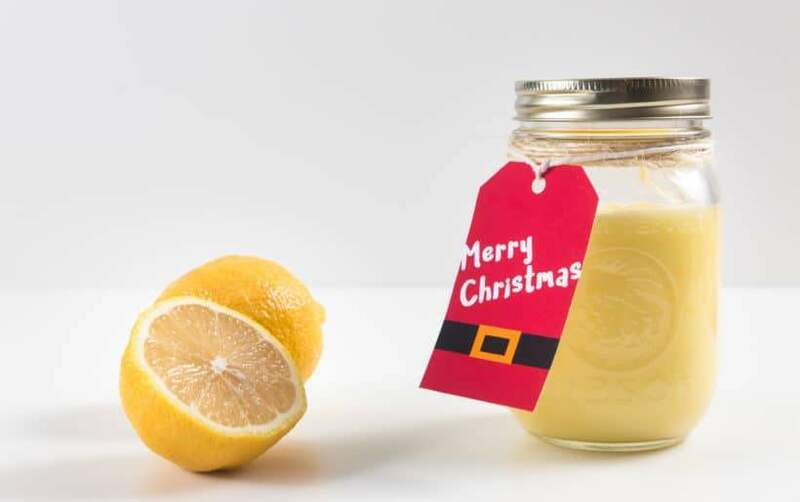 Great DIY Christmas Gift. 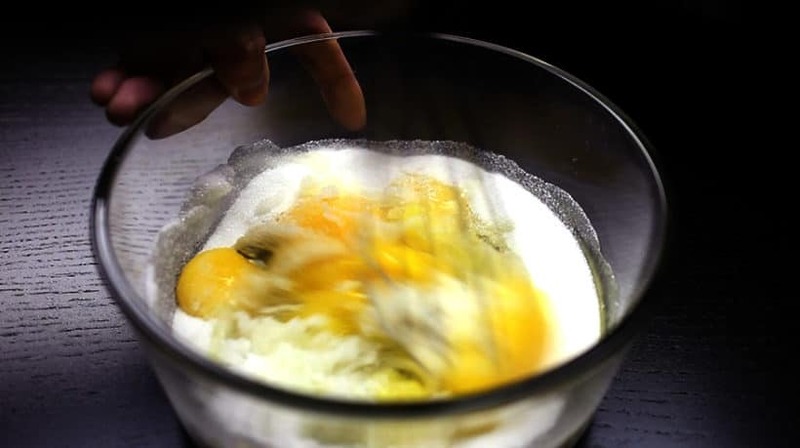 Create Egg Mixture: In a 7”x3” pyrex oven-safe glass container, break and whisk together 4 (204g) large eggs and 2 (38g) large egg yolks. Add 225g (1cup) granulated sugar and mix well. Add in a pinch of salt, 1 tbsp (5g) lemon zest, and 235ml lemon juice. Mix until combined. Wrap the glass container very tight with aluminium foil. 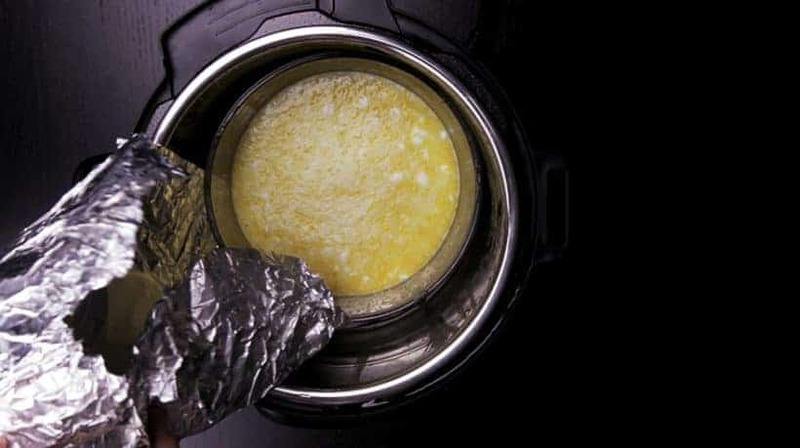 Pressure Cook Egg Mixture: Pour 1 cup (250ml) cold water in Instant Pot. Place a trivet in pressure cooker and carefully layer the tightly wrapped glass container on the trivet. Close lid and pressure cook at High Pressure for 1 minute, then Natural Release for 10 minutes. 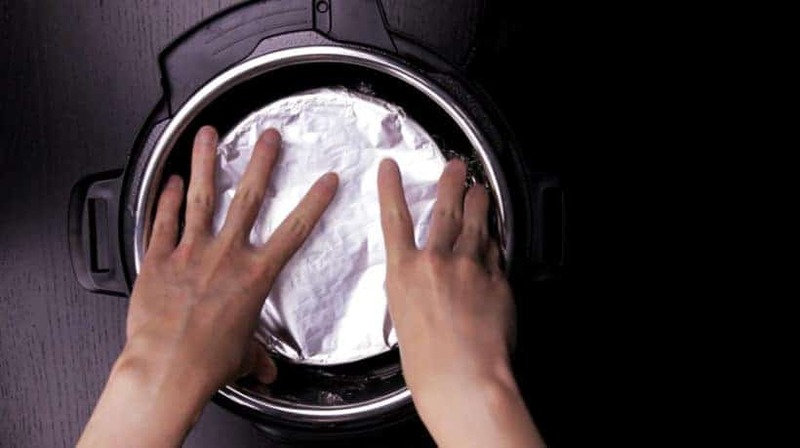 *Pro Tip 1: If your aluminum foil is quite thick, add on an extra minute to the pressure cooking time. *Pro Tip 2: The floating pin will drop at the 7 - 8 minute mark, but don’t touch it until it has reached 10 minutes. 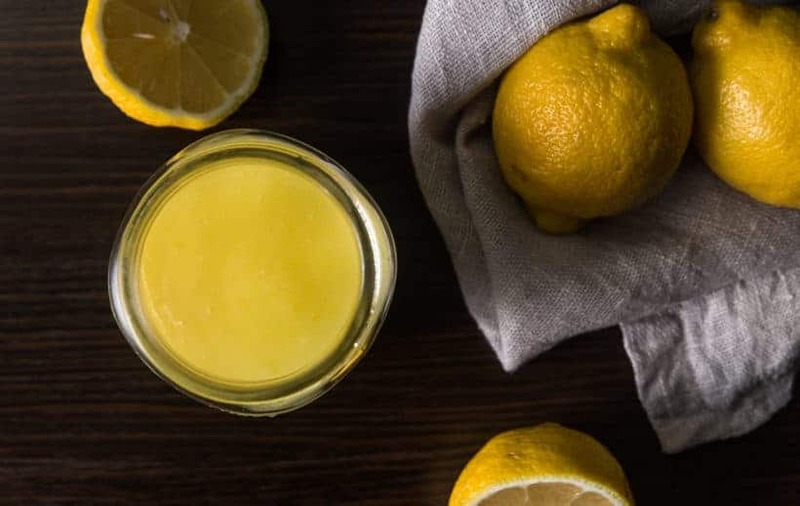 Create Instant Pot Lemon Curd: Open the lid carefully. Carefully take out the glass container. Discard the aluminum foil. When you first see the egg mixture, it will look like an egg custard. Give it a few quick whisk and watch magic happens. Add in 100g room temperature unsalted butter, one half at a time and use a whisk to emulsify the butter with the egg mixture. Lemon curd is done and it will thicken as it cools. You can filter out the lemon zest with a fine mesh strainer if you like. 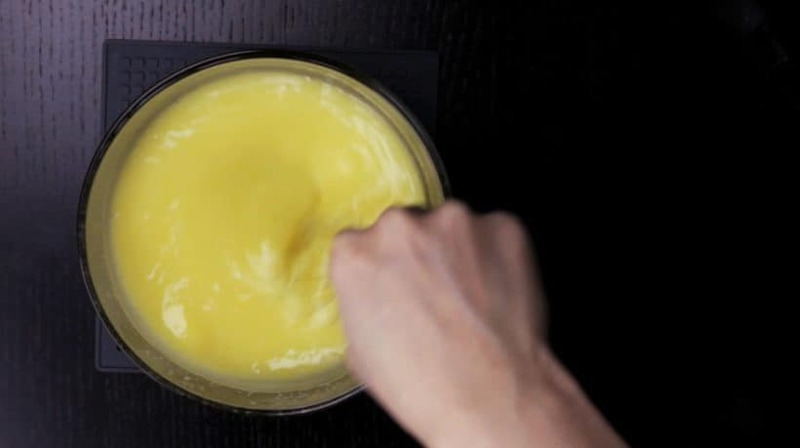 If the lemon curd is lumpy, you can smooth it out with silicone whisk. Serve: Chill in the fridge for at least 4 hours before serving. *Pro Tip: don’t use reactive tools to make the Instant Pot Lemon Curd as they may contribute a metallic taste to the final product. Best to use oven-safe glass containers and silicone whisk for best results. I made the lemon curd last night & added it to my homemade yogurt this morning & topped it off with blueberries! So wonderful, just perfect sweet lemon flavor! I was wondering how the lemon curd would freeze? Have you tried? It made so much & My hubby is diabetic so i can’t let him near it. Is that mean? The lemon curd will freeze well. No, not mean at all hehe. I weighed all ingredients, used the same pyrex bowl, wrapped with reynolds wrap aluminum foil and followed directions exactly. My curd came out very thin also. I noticed you recommended adding some cornstarch for a thicker curd. How much would I add and what point in the recipe would I add the cornstarch. I would like a consistency that I could use in tarts. Also would you recommend cooking it for a couple of more minutes High pressure? The taste is great but just too thin. Thank you. Yes, I recommend cooking it for a couple more minutes and see what happen. You can add the cornstarch after pressure cooking. I’m giving this recipe five stars because it tastes so delicious! However, one minute is not nearly enough time to cook it. I tried 7 minutes with thin foil and a silicone sling. It was Still very funny! Each time I had to cook it on the stove to thicken it up. I’m wondering if I could use a stretchy microwave safe top for my bowl instead of foil? What kind of materials is the stretchy microwave top. You will probably have to extend the cooking time as the stretchy top will most likely be thicker. I made this recipe today and followed it exactly, but it never thickened up and is really runny. I used a 6 Qt instant pot, and one layer of regular (not heavy duty) foil. Not sure what went wrong. I have a suspicion that it didn’t get hot enough to cook all the way through. Can it be salvaged? You can cook the lemon curd again if it is too runny. I’ve made this recipe twice now and both times it was delicious! However, the cooking time for me was the problem. It failed to set up after cooking for 2 minutes… both times! I increased the time to 4 minutes and then it set. I’ve read a few other comments here that the cooking time posted is not sufficient, so it might be good to alert others that a longer time may be required. I’d hate for anyone to think the recipe failed, it just needs longer time to cook. The end product is absolutely heavenly! Hi, I made your recipe today, it is fabulous. I was wondering if it can be frozen? There is two of us, more than we can use in a couple of weeks. Thank you for the delicious recipes. For best quality, the lemon curd can be frozen for up to 3 months. It may darken a bit, but it will be safe to consume. I’m really excited to try this recipe! I see it calls for the pot in pot method. I have a 3qt inner liner that I use in my 6qt when I need PIP. Would that be ok to use? Stainless steel should be non reactive, no? It should work fine, but you will probably want to increase the cooking time. Tried this recipe for the first time today. This lemon curd is delicious. The only change I made was not to grate the lemon zest but for flavor I used the whole peel of a lemon, which is easier to cut and discard. I was gifted a bag full of Meyer lemons from a friend’s tree. Can I follow the same recipe, or should I use less sugar since they’re sweeter? I’d love your thoughts as I’ve been wanting to try this recipe for months! Thank you for your question. Meyer lemons will work fine as well. I recommend using the same amount of sugar to see if you like it. My first try didn’t turn out so well. It didn’t get custard like. and didn’t set up correctly. I tried a different recipe and it turned out grainy textured. So I came back here and tried again. SUCCESS!!! It is creamy and delicious. Thank you for sharing this recipe. I substituted lime for lemon, it was wonderful with plain yogurt. Thanks for posting this. I was thinking of trying the same thing, and am glad to hear that it turns out well. I put lemon curd on my morning yogurt, too! The bowl I want to use to make it is a Pyrex mixing bowl that fits perfectly inside my 6-quart insert. However, when I put Aluminum foil over it, it touches the insert all the way around. Does this matter? Thank you for your question. It will be fine. Just following up to let you know that I made this today, and it was so much better than perfect. Thanks for the recipe, and the tips! This recipe was extremely east and produced a gourmet product. Can I use the same recipe if I wanted to make orange curd? Would the time change at all? Thank you so much for your question. It will work. The sugar will need adjustment for sure as the fruits have different sweetness level. Thank you so much for so many amazing recipes. I have been wanting to make the lemon curd, I am just worry about using Pyrex as it hasn’t been tested. I am not sure if I can use silicon baking pans? Can I ask if silicon pan will works for your lemon curd recipe? Thank you for your question. Silicon pan will work fine and I will recommend adding 2 – 3 minutes to the recipe. I made the recipe as written, except that I used only 50 g of butter, which made the curd smooth enough for my taste. I cooked it in a 7×3 glass pan, covered by a single layer of foil, for one minute at High Pressure, followed by 10 minutes natural release. The curd was cooked through, and was not at all runny. This lemon curd is excellent on plain yogurt! I assembled this in a Corning casserole of the same dimensions as your Pyrex, 2 mins at high pressure, but it was liquid. 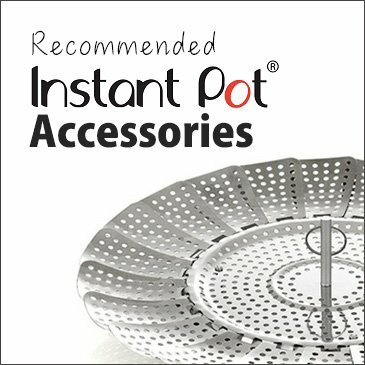 Does the type of pot make a difference, and if so, what adjustment do you recommend for Corning? Thanks. Thank you for your question. The type of pot will make a difference as the heat transfer rate will be different. I will increase the cooking time by 2 – 3 minutes. I made this as directed and it is fabulous! First time making it, I will definitely make it again. Trying this today! If I put in jars for friends and family, how long will this last in the fridge? Thank you! It will last roughly 2 weeks in the fridge. First time making lemon curd. Followed the directions to a tee. Perfect! So good! I am sure those who receive it as gifts will agree. Holy Moly! This turned out beautifully. My Lab Rottie licked the bowl clean! Thank You for the easy receipe. Happy to hear the result! Which is for poultry and sets for 20 min.) So I only let it go for 10 min, and then followed your release instructions. Turned out great!! I even had it on waffles instead of syrup! I love it warm! Thanks! 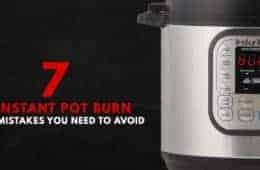 If I use an 8 quart Instantpot, don’t I need to always have 2 cups of liquid/water inside? If so, then those of us using the 8 quart size should be using 2 cups vs. 1 cup of water to cook the curd, correct? I know the manual says that, but you don’t need 2 cups of liquid inside the DUO80 to build up pressure. For short cooking duration like this one, 1 cup will be fine. I have never made lemon curd before, but this was AMAZING! The only thing I’ll do differently in the future is to strain the zest out after cooking. The flavor was so incredible: tart, smooth, delicious! Thank you for writing such clear instructions – it made something that looked daunting at first fairly simple! Happy to hear you enjoyed the Lemon curb. This looks like a fabulous recipe! Do you actually wrap the entire bowl in aluminum — or is it enough to cover the bowl tightly with aluminum? Thanks! Just enough to cover the bowl tightly will be fine. Lemon curd novice here. Wanted to try a lemon cake for my husband’s birthday. After much research found yours to be the easiest. The lemon curd is amazing. Thanks for your lovely feedback Kay! 🙂 Glad you enjoyed the lemon curd. Can’t wait to try this. I have 6 bags of Eureka lemons and already given many away. My tree was abundant and year round producer, so I love lemons and recipes to use them in. I don’t have a silicone wisk and wish to try this recipe today. Since metal is reactive. Should I not use my vita – mixer or immersion blender? I do have a plastic blade for my food processor. But just wondering about the other two options as others have used them, but, I don’t want a metallic taste. Also I think the remark about heated foil being bad for health. Is it true in the pressure cooker? As is the pressure cooker actually not applying enough heat to cause the foil to react. I thought I read it somewhere, but, I’m not sure. Thank you, I love your tested recipes and have used many with success! It doesn’t always give the metallic taste, but I would recommend using the plastic blade just in case. There is a study in 2012 that said higher temperature will leech out more aluminum, but more studies is needed to come to a conclusion about the long term effect. As long as the aluminum foil is not in direct contact with the food, it should be okay. Have you tried making peach curd in the instant pot? I’m wondering if I use a peach curd recipe and the instant pot directions here for the lemon curd if it will work. We haven’t done peach curd in the Instant Pot, but it should work just fine. I would recommend increasing the cooking time by 2 minutes for peach. Love the flavor. I realized after I had everything ready to go into my electric pressure cooker that this recipe calls for HIGH pressure. I have a cheap electric pressure cooker that doesn’t have pressure settings – you get medium & that’s it. It wasn’t enough. It was liquid even after it cooled. However, I threw it on the stove top & cooked it on low for 6 minutes until it thickened. The ratios for ingredients are perfect. I’m going to hold on to this recipe until I get a fancier/more expensive Instant Pot with the multiple pressure settings so I can try it again. 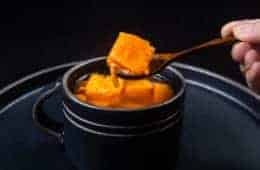 If you would like to use the recipe in your electric pressure cooker, you can increase the cooking time by a few minutes. It should work fine~! Mine also was liquid after cooling in the fridge. I was so disappointed and still don’t know what I did wrong. Can I cook it on the stove even if I’ve already added the butter? Thanks! sorry to hear what happened. You can still recook it on the stove or in the IP after cooling in the fridge. Followed your directions to the letter. FANTASTIC! I’m using it with a lemon-lime instant pot cheesecake and eating it directly from a spoon. Happy to hear you enjoyed the recipe! I made this and it was delish, BUT there were definitely bits of cooked egg white in the finished curd so I had to push it through a mesh strainer. Otherwise it was perfect despite my using a metal juicer, whisk and strainer. (no metallic taste at all) That said, next time I will use a food processor or blender rather than whisking by hand prior to cooking, as I’ve made another recipe (in jars) in the past which utilized a food processor and did not leave me with cooked egg chunks or an extra step to strain them out. thank you for your kind words and honest feedback on the recipe. Could I use this recipe to make a lemon meringue pie? I was thinking of pouring the resulting curd onto a Graham cracker base crust(it does not become soggy), covering it with meringue and putting it in the oven to get the gold peaks. It is 6 egg yolks in total. How do I avoid using metallic tools? My whisk is silicone and my bowl is glass but the lemon squeezer is metal and so is the strainer to catch the seeds.. hmmm..
We squeezed the lemon by hand and the seeds can be removed after with non-metallic tools. I’d like to use this lemon curd as a base for lemon bars. Right after it’s done cooking and I add the butter, will it work if I put it directly on a crust and bake? Thank you! Can this be made in a silicone dish? Silicone dish should work just fine. I tried this today!! I halved the recipe to fit it in my Pyrex dish in my 3quart IP and it worked great. Perfect consistency with the 1minute+10min NPR. I will also confirm that using a metal whisk does indeed impart a metallic overtone taste to the dish, which was super disappointing, but I knew I was taking a risk. Will definitely be investing in a silicone whisk! Thanks for the great recipe. I made this tonight and followed your recipe but added two minutes because I had extra heavy foil. Came out perfect! Thank you for this recipe. It is delicious! Just made the lemon curd and the end result should be great once it has cooled. I strained mine though because I had a lot of cooked yolk in my curd. Should I let the eggs come up to room temperature next time? Is that the reason the yolk’s did not mix enough and so cooked a bit more like scrambled eggs? I’m wanting to make a passion fruit curd. Can I substitute passion fruit puree for the lemon in this recipe since the passion fruit is tart as well? Thank you so much! Like several others, my lemon curd, following this recipe exactly, was a bit runny. Excellent taste, but runny. I’m wondering if it needs more than 1 minute on high pressure. After it’s chilled in the fridge for a couple days, can I do anything to thicken it? It could be the aluminum foil is too thick. Yes, you can still re-cook it after a couple days. Just reheat it for another minute on high pressure. Where can I purchase the Pyrex oven safe glass container that you used in this recipe? You should be able to find them in Walmart and Amazon. I made your lemon curd today exactly following your instructions. Like several others, only one minute of high pressure with 10 min of NR barely warmed the egg and lemon mixture. After noting, as another reviewer did, that most other recipes call for 10 minute of cooking time’ I brought it up to pressure again for 9 more min, with 10 min release and this time it looked like your picture…a little lumpy. When I started whisking in the butter is when the magic happened. I used my metal balloon whisk that I’ve never had any problems using for stovetop curd making and it turned out great. Smooth and creamy and lemony deliciousness. Next is a batch of your Dulce De Leche. Love the idea of not messing with jars so hoping it turns out! Thanks for the great recipes. The egg and lemon mixture should be plenty hot after 1 minute High pressure + 10 minutes natural release. Are you on high altitude or was the lid pushed down? I made this last night. The flavor is great, but it is super runny. I even put it back in for an extra minute. So sad. Any ideas of what to do with it or how to eat it? Thank you Amy & Jack! This is delicious. Since I had the heavier foil I tried 3 minutes and it was perfect. What a delicious recipe! I made three batches. Thank you for your work and a happy new year to you both! 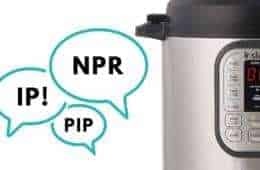 I have an 8qt instant pot. When I made this with 2 heavy foil on 2 minutes it came out runny. I microwaved it for 1 minute at a time for a few minutes to thicken and it was still delicious, but do you have any idea what I might be doing wrong? I have the valve sealed, heavy foil, and waited ten minutes before removing. Thank you!! I would think the two heavy foil slowed down the steam from cooking the lemon curd too much. My lemon curd tastes great but is still really thin after 5 hours in the refrigerator. Any thoughts? Sounds like it is slightly undercooked. You may want to reheat the lemon curd to see if it will thicken up better. I love your site! As hard as you worked to create a recipe that does not use jars, I am looking for one that does so that I can give as gifts. Is there a way to convert this to canned and sealed lemon curd. It will need to be stirred after cooking in mason jars so I don’t have a good way to convert it yet. Ok, so I am a MESSY whisker! Lol! Can I mix this up in a larger glass bowl and then transfer to cook and then retransfer to cleaned glass bowl after cooking to add butter? I just don’t want to mess this up, as I think I’m really going to like this. My first attempt is cooking now! Would you have to alter any of the other ingredients ?? Thanks in advance as I’m new to making lemon curd. I halved all the ingredients because I found out I only had 4 lemons, and 2 eggs left! It came out pretty amazing. I put in 2min on high pressure instead of one as I had no extra egg yolk. The texture came out as creamy but did set well in the fridge. I used it as a frosting for my traditional oven cheesecake! Hubby and I are hooked! Thanks a lot Amy+Jacky! Lemon curd + Cheesecake = Heaven! This recipe turned out delicious to the taste and gorgeous to look at. I’ve never eaten lemon curd before, let alone cooked it, so the results were doubly satisfying. Thank you for trying out this recipe and we are so happy to hear you enjoyed your first bite of lemon curd!! Thank you! This is so, so good. I used Meyer lemons fresh from a friend’s tree, and loved the result (and the free lemons!). I’m thinking this would also work well to make Key Lime curd. For that I’ll cheat and use the Nellie and Joe’s bottled juice. Made this last night and it was super simple to do. I used 4 whole eggs and 2 egg yolks. It looks exactly like in the pictures above. Chilled overnight and has the perfect thickness . The only thing is it has an eggy taste and smell to it. Is there a way to get rid of that? Thanks for sharing such a wonderful recipe. I dont want to be put off because of the eggy smell. A few drops of vanilla extract should do wonder. I have made lemon curd several time on the stove top which means stir, stir, stir…..Your recipe was so easy and turned out nearly perfect. I say nearly because I did see a couple of very small white lumps in it (I think it was egg white). Instead of straining I decided to put it in the Vitamix and now it is perfect, thick and yummy. It made almost 5 half pint jars. Thanks for the wonderful recipe. Mine did not get thick either…Do you really only set the cook time for 1 minute? The other recipes I have seen are for 9 or 10 minutes. It shows the cook time before the recipe as 20 minutes, which would be 10 min cook time and 10 min NPR? thank you for your question. The total cook time includes the get up to pressure time as well. I am thinking the result difference is caused by the thickness of aluminum foil. Ours is quite thin. I will make some adjustments to the recipe. I followed your recipe to a tee measuring everything with a food digital scale. I let it cool than poured into Mason Jars and refrigerated overnight. 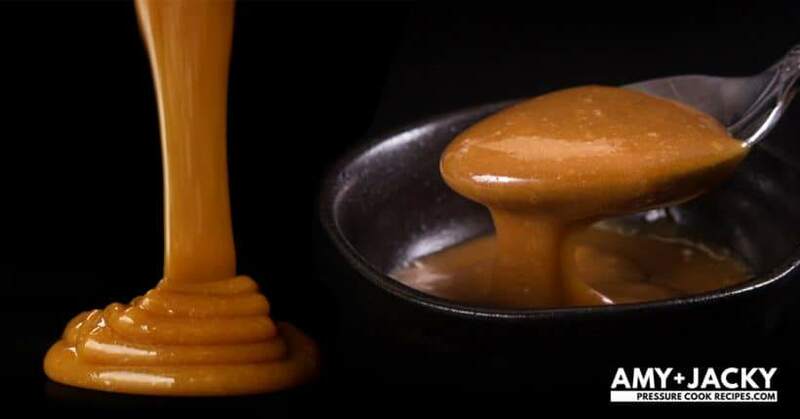 It never firmed up and is a syrup consistency. I assumed by reading other curd recipes it’s under cooked. Can I save it by putting it in a pan on the stove top and reheat while wisking it. Yes, you can reheat the lemon curd again to cook it more. You can also use cornstarch to thicken it as well. May I ask What kind of container was the lemon curd cooked in? I cooked it in a 7 X 3 pyrex glass bowl just like the one in your pictures. I did reheat it on the stove top until it thickened. That did the trick. Happy to hear it worked out in the end!! 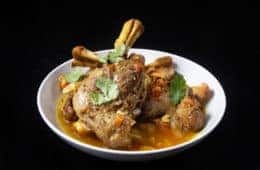 Thank you very much for posting this recipe!! Oh my goodness, is this lemon curd ever delicious! Just the right amount of tartness for me. The yield is 3 cups (24 fluid ounces) and it filled two 12-ounce Ball (or Mason) jars to within about 1/4 inch of their rims. Perfect. Using a hinged lemon juicer, I used 8 1/2 medium lemons which weighed 1 1/2 pounds as purchased. 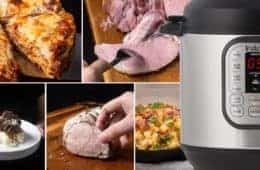 These gadgets do a quick job of juicing but they don’t squeeze as much juice out of the lemons as do the juicers with a ridged center cone and a cup underneath, which take more elbow grease. In order to completely mix in the stubborn parts of the egg whites I gave the mixture a quick buzz with my immersion blender, which chopped the lemon zest a little finer as well, resulting in a smoother lemon curd. Any foam that the blender creates will disappear during cooking. I mixed the ingredients right in my sturdy 8-cup glass souffle dish which just barely fits (width-wise) into my Instant Pot stainless bowl, so you know I’ll be doubling the recipe in the next day or two. It will be a challenge to find a taller bowl so I can triple the recipe. If anyone has any ideas of 8- to 12-ounce inexpensive but attractive glass, pottery, or china containers with secure lids to give as gifts, I hope you’ll share them. This is going to be a Lemon Curd Christmas! Thank you, Amy + Jacky, for yet another winner! So glad to hear you liked the lemon curd! Can this recipe be doubled or tripled? You may want to let it natural release for longer depending how much you are making. Do you think the lemon curd would withstand the heat if baked in the center of muffins? Or would they simply absorb it during the baking and rising? Lemon curd is a great filling for cakes and turnovers! Can’t wait to try this!! Question: which type of lemons did you use? I have regular lemons as well as Mayer lemons, which add a far sweeter but more delicate taste. Which would hold up better in this recipe? We used Eureka lemon in this recipe. Meyer lemon will work as well. It will come out less tart and sweeter. This sounds amazing. I love lemon curd, but having been dairy-free for awhile and now having two kids who also need to be dairy-free, I’ve been missing it. I am thinking of trying to make this with a dairy-free butter alternative. Do you think this might work with coconut oil? Or maybe with a vegan margarine? I’ve never actually made lemon curd before so I don’t know much about how important the butter is, and whether or not messing with the water content with a fat replacement might mess this up? thank you for your message. Butter is there for the texture and flavor. Ghee or coconut oil will be a good choice. You stress using non-reactive tools but use aluminum foil. I do not use aluminum foil in cooking since it can leech into food. Any suggestions for covering the glass container in the pressure cooker. Would a Cornell luncheon plate work? I am enjoying your site BTW. A Cornell Luncheon plate should work just fine! Can’t wait to try this one. The last one I made was grainy ?. Have you tried this recipe with orange or grapefruit? I have lots of citrus on hand right now and am debating which to do! We haven’t tried this new method with orange or grapefruit yet (only tested with lemon). Please let us know how it goes if you do try them. Can you tell me what the shelf-life is of this curd? The lemon curd will be good for 2 weeks in the fridge. For the 7 minutes natural release, the floating pin (metal pin) probably didn’t drop yet and prevented the lid from being open. You can carefully turn the venting knob from the sealing position to venting position and open the lid when the floating pin drops.